Bear Valley is actually two different spots. 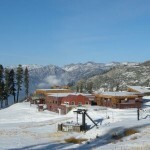 Bear Valley Mountain Resort operates under a lease with the Stanislaus National Forest and is a big attraction for all ages year-round. Special summer events include mountain biking, hiking and the “Tough Mudder” event held in October. Then jump forward to a full winter world operation for sliding enthusiasts. No real estate or lodging is available at the mountain itself. Leave the lodge parking lot and travel downhill just about 3 miles to the Bear Valley Village below. No chair currently connects the two, but plans are developing for such a link; however, you can ski from the Mountain to the Valley and shuttle back up. The Mountain, in a nutshell, is about 1,680 acres, has eleven lifts serving 1900’ of vertical and it has an 8500’ summit that captures excellent snow coverage. Bear Valley Village is where housing options from lodge rooms to condos to your own luxury mountain chalet exist. Shops and restaurants serve the small number of hardy year-round residents and all manner of recreational visitors who find this scenic community as the last stop before exploring the undeveloped high country of Ebbetts Pass. 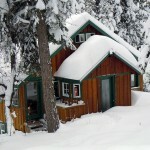 The Valley is notable for its unplowed streets in the winter, meaning access by snowshoes or snow mobile only. It’s truly a unique area with endless recreational opportunities. Here are some photos to look at and links to follow to get you started, but nothing beats your first visit to fully comprehend the unique flavor of Bear Valley. CCR Insider: You can count on easy access up reliable Ebbetts Pass Highway 4; there’s simply no pass to get over and no traffic jams. It’s geographically located between Lake Tahoe and Yosemite. BV has good snowfalls similar to many Tahoe resorts. Considered a mid-sized mountain, it’s the 8th largest in California, its rep is for being a non-pretentious family ski resort where skis and boards share the space. Boasting an outstanding beginner ski program, there’s no better place to get the tots started. It also has abundant intermediate cruiser runs while the advanced terrain needs the right snow coverage, but your legs will know it when you find the steep. Bear Valley is one of the last ski areas where jeans still qualify as ski pants. The biggest tip is that you can ski midweek from chair to chair with no lines and a high speed quad that will deliver more runs than your body will accept. Enjoy!